Today the scenic beauty of Transylvania, a vast green province in the heart of Romania, remains as miraculously unblemished as when I first glimpsed it nearly 30 years ago. What has changed, however, is that this fascinating and undiscovered corner of Europe now has a number of charming guesthouses, along with some very good restaurants, which make it a pleasant and comfortable place in which to travel. The roads are also better and so is the signage, although you should come equipped with both a GPS and paper road maps. Transylvania is a destination for the travel connoisseur. 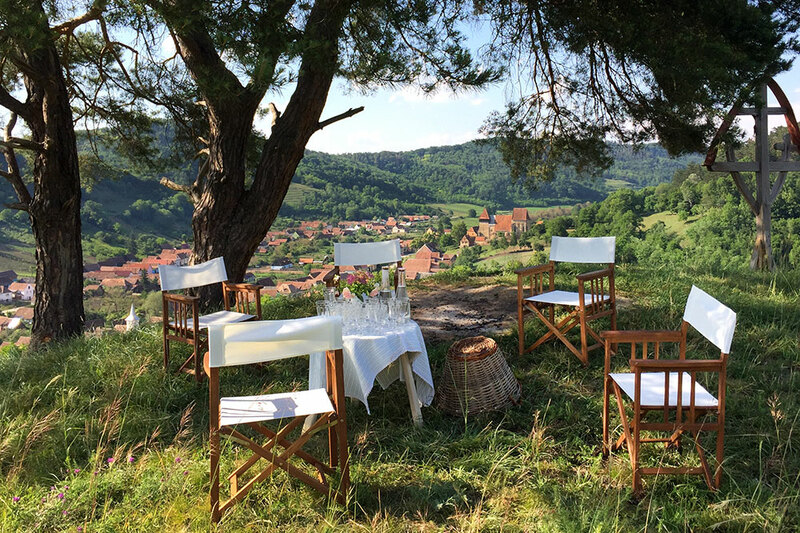 It is a place to spend time amid some of the last preindustrial landscapes in Europe, as well as to discover Romanian culture, history, food and crafts. There are few places like it left, which is doubtless why it has won over such discerning travelers as Britain’s Prince Charles, who loves the region so much he now owns several properties there, including one you can rent. The prince, who claims distant kinship with Vlad the Impaler, the 15th-century Wallachian ruler on whom the Irish novelist Bram Stoker based his 1897 novel, “Dracula,” first visited Transylvania in 1998. Having been “totally overwhelmed by its unique beauty and its extraordinarily rich heritage,” he has since become deeply involved in initiatives to preserve the region’s traditional way of life, one based on small-scale agriculture. 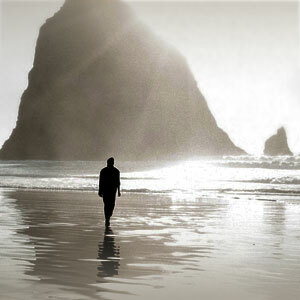 I hadn’t been expecting such beguiling panoramas, landscapes every bit as enchanting as those of Tuscany or Provence. I first laid eyes on Transylvania through the windows of the Orient Express, aboard one of the first trains to run from Istanbul to Venice after the fall of the Iron Curtain. On that journey, after spending an off-the-train night at a hotel in Bucharest, we made a stop at Sinaia to visit the Peleș Castle, the neo-Renaissance edifice built by Romania’s King Carol I from 1873 to 1883. Then we reboarded and headed north. Looking up from my book and glancing out the window half an hour later, I was astonished by the beauty of the countryside. Shadowy forests gave way to neatly tilled fields, meadows dotted with grazing cows, orchards bright with red apples and wildflower pastures that reminded me of the intricate prettiness of medieval embroidery. Perched on hilltops were villages of pastel-painted houses and fortified white-walled churches. I knew little about Romania in those days, but having read recent newspaper accounts of the blood-soaked demise of the dictator Nicolae Ceaușescu, I hadn’t been expecting such beguiling panoramas, landscapes every bit as enchanting as those of Tuscany or Provence. 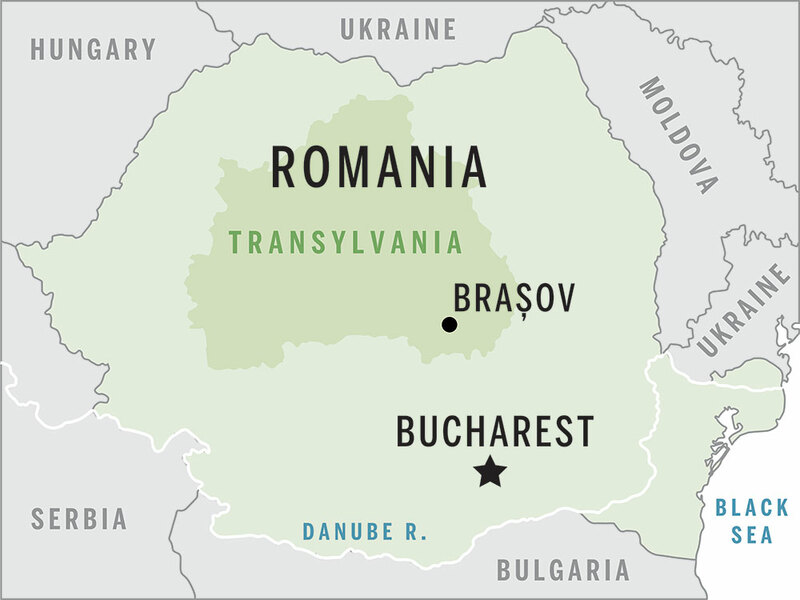 Studying a map, I discovered that we were traveling through Transylvania and immediately vowed to return. It is an 11-hour flight from New York to Bucharest, via London or Frankfurt. 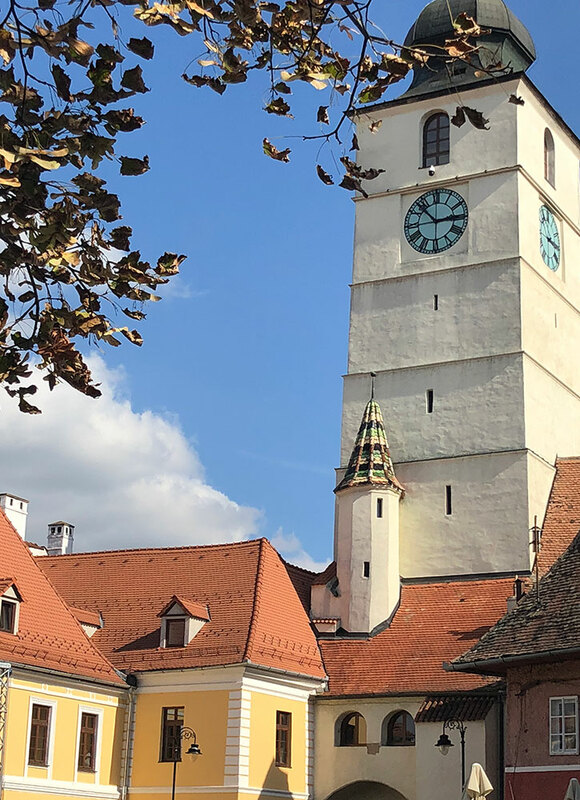 On my recent return visit, I headed straight to Brașov, the gateway to Transylvania, a city located a three-and-a-half-hour drive north of Romania’s capital. Despite commercial and industrial zones on its outskirts, Brașov has a beautiful medieval center. Wanting to be within walking distance of the principal sites — the Piața Sfatului, or Council Square, which has been the heart of the city for more than 500 years, and the huge 14th-century Biserica Neagră (Black Church) — I stayed at the three-room Vila Katharina, an intimate property in a restored 18th-century house in the center of town. There, the multilingual staff were welcoming and helpful. My sunny Onyx Room, with its parquet floors and art deco-inspired wallpaper, was spacious, comfortable and furnished with an antique wooden bed, a chest of drawers and a small sofa. The bath came with a deep tub and a white-marble washstand with brass fittings. In the morning, an excellent breakfast was served on heirloom porcelain in a small, elegant dining room. 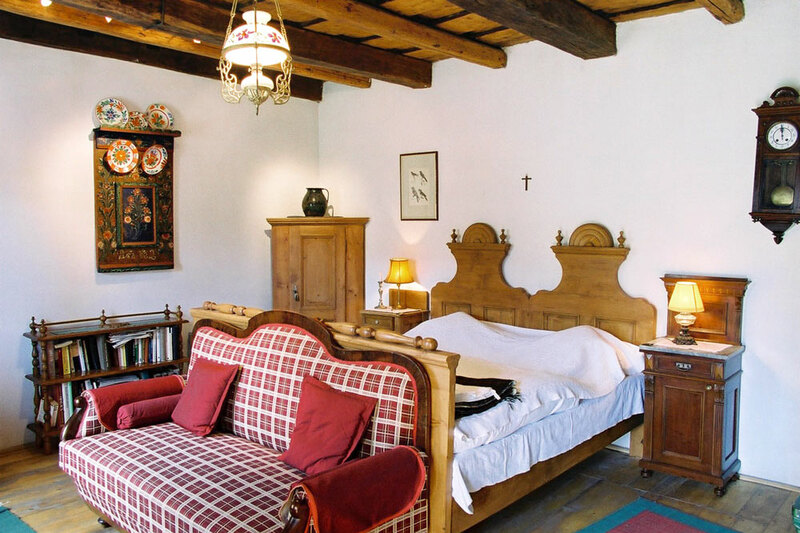 The Vila Katharina is an atmospheric little place that is more than adequate for an overnight stay. Having driven for 45 minutes to the north of Brașov, I arrived on the outskirts of Micloșoara just as the cows were coming home for the night, creating a bovine traffic jam that was announced by the metallic clang of their bells. Wearing straw hats and vests, the farmers leading the cattle shrugged and grinned to excuse the wait they were imposing on me and the drivers of several horse-drawn wagons of freshly mowed hay. Obliging staff; beautiful antiques; excellent breakfast; convenient location. Baths lack separate tubs and showers. Ask the hotel for detailed information on parking before you arrive. 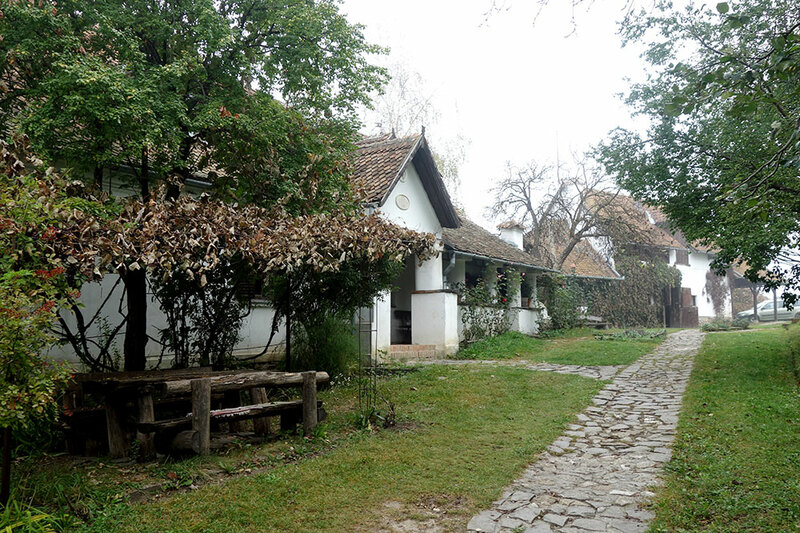 Eventually, I arrived at Count Kálnoky’s Transylvanian Guesthouses, an inn with 10 accommodations distributed among several whitewashed houses and farm buildings in the village. I was greeted in an antiques-furnished salon by the manager and offered hazelnut cookies and a shot of locally distilled kümmel (caraway seed eau de vie). He explained that the room price included a hearty country breakfast and a table d’hôte dinner with wine in the evening, plus an optional excursion each day. 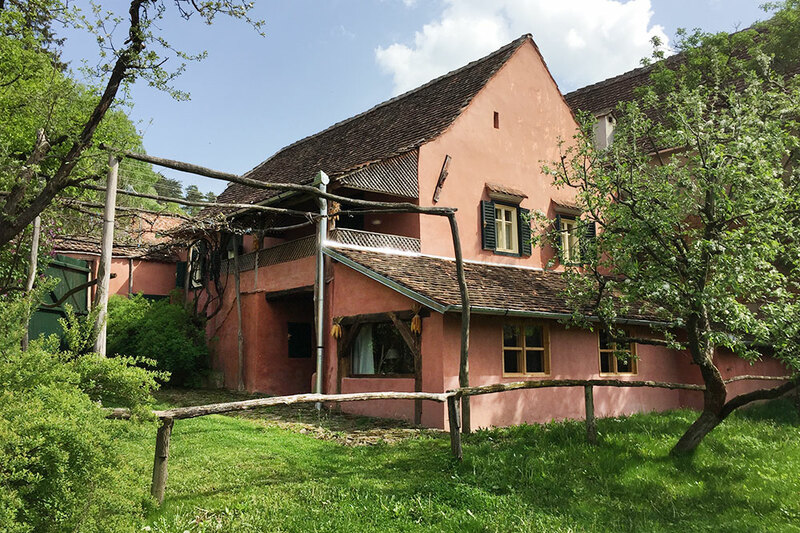 We found the two most worthwhile excursions to be “The Land of the Szeklers” tour and the “Horse and Cart Ride.” A bit of Transylvanian history explains the particular interest of these outings. For centuries, much of the region was governed by the Hungarian crown. In 1143, King Géza II invited German settlers, now locally known as Saxons, to relocate to the lands along Transylvania’s western border as a way of repopulating them after years of war and preventing encroachment by the Ottoman Empire. Here the Germans joined existing populations of Romanians, Roma/Gypsies and Szeklers, a Hungarian-speaking people who had lived in the region for centuries, as well as a sizable Jewish community (now much diminished by genocide and emigration). 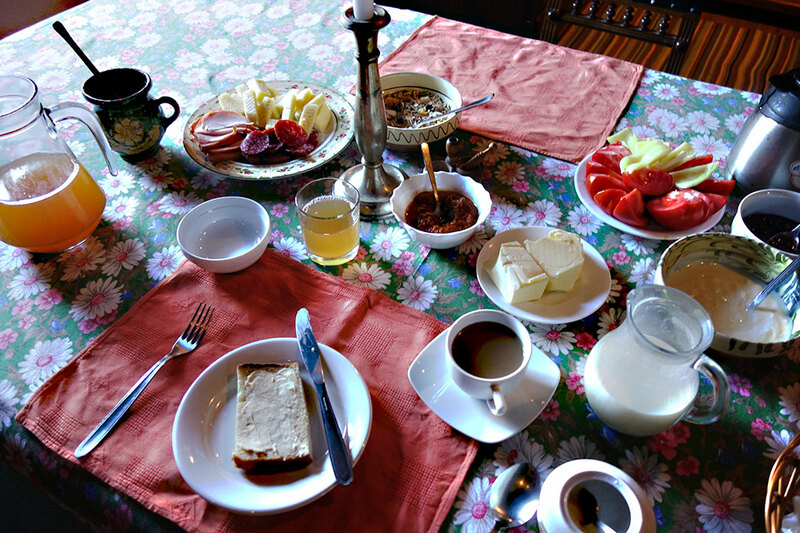 The Szeklers tour includes visits to a working water-driven flour mill built in 1835, as well as to traditional craft workshops, including a woodcarver, a weaver and a blacksmith. 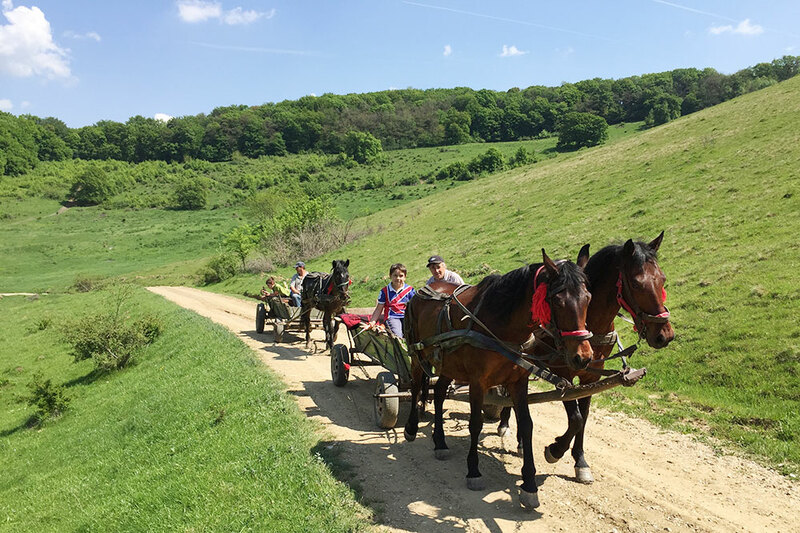 In contrast, the horse-and-cart excursion delivers a slow-motion experience of the Transylvanian countryside, led by an English-speaking naturalist, who explains the flora and fauna (including brown bears and wolves) of the region. 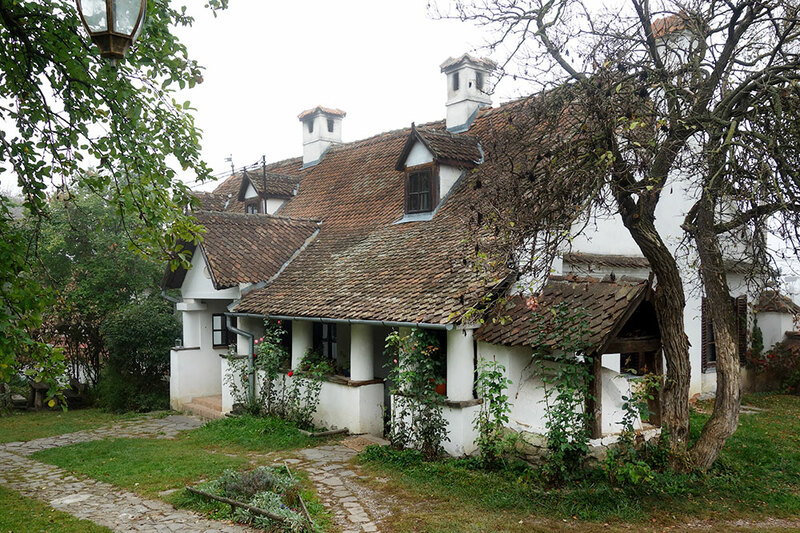 The guesthouses are the project of Count Tibor Kálnoky, who grew up in various European locales while his family was exiled from its native Romania. The Ceaușescu regime was particularly hostile to the Romanian aristocracy, so it was a risky trip that Kálnoky and his father made to Micloșoara in 1987 in order to visit their family seat. It was also an awakening for the young count. After the fall of Communism in 1989, he immediately set about buying back his family’s former properties, his goal being to create a new type of rural tourism that would offer work to the locals, preserve Transylvania’s natural and historical heritage, and offer an authentic and intimate experience of the region to visitors. My large room in a village house was furnished with a pair of antique wooden beds topped by extremely comfortable wool mattresses specially made for the inn, painted wooden wardrobes and marriage chests, a writing desk and local woven rugs on wooden floors. However, the room lacked a telephone, a television and Wi-Fi, a personal decision by the count, who hopes his guests will disconnect from the rest of the world to become deeply engaged with Transylvania. On a cool day, the tiled woodburning furnace in the room was hot to the touch and was fed constantly by staff with access to an outside door. A spacious tiled bath came with a combination tub and shower and organic local bath products. Dinner that night was rather like a party. The other guests included a friendly English couple, a charming Irish woman and her two daughters, and a witty American trio from Philadelphia. Conversation flowed freely, as did the excellent local wine, while we consumed a traditional ciorbă (soup) made from vegetables grown in the guesthouse gardens, a goulash-like beef stew with fried potatoes, and an apple cobbler with thick cream, dishes all prepared by women of the village. The sky was full of stars as I walked back to my room. In a place with clean air redolent of the surrounding forests and no noises louder than those of a barking dog, I didn’t get past the first page of a new book before falling into a deep sleep. Warm hospitality; tranquil setting; comfortable rooms; amiable staff; delicious food and wine; fascinating daily excursions. The lack of a bar in the main manor house. Count Kálnoky also offers riding holidays using his own stable of horses, including Shagya-Arabian, Lipizzaner and Gidran breeds. 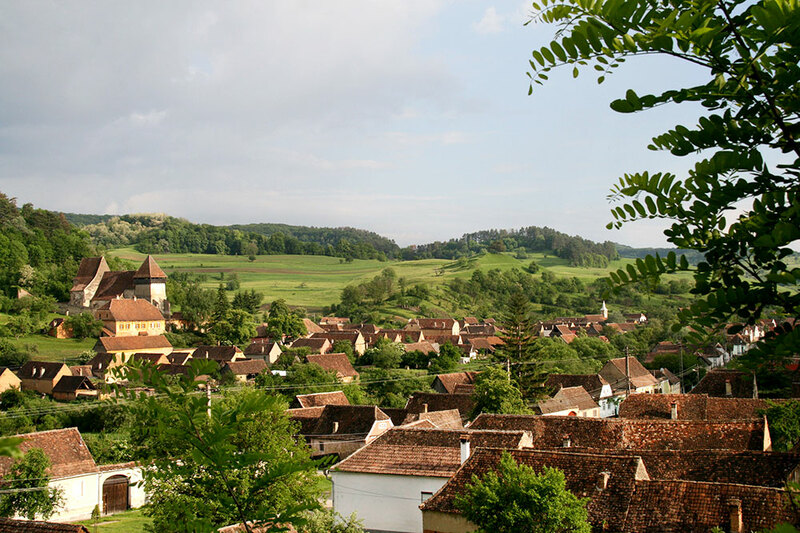 As in Tuscany or Provence, many days in Transylvania are spent exploring the region’s picturesque villages. 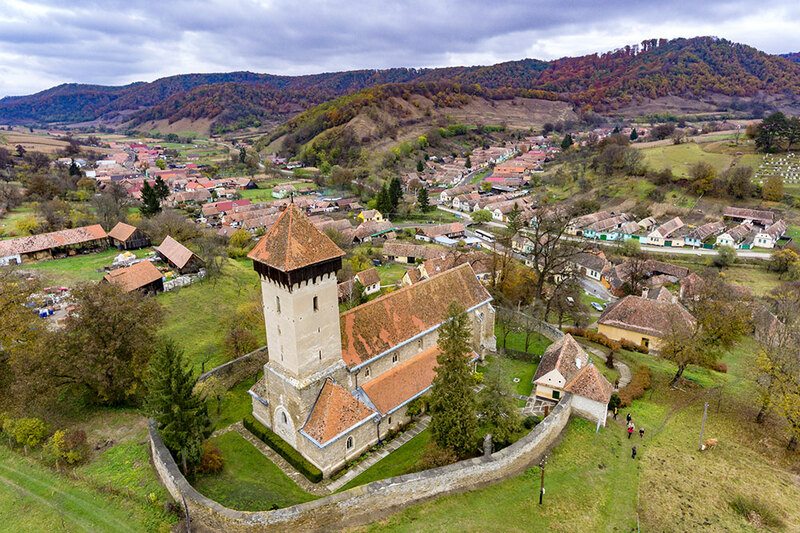 Among the most attractive and interesting are Biertan, with its fortified church (with an amazing wooden lock), Copşa Mare, Criț, Mălâncrav, Meșendorf, Saschiz and 13th-century Viscri, which lies a 45-minute drive from Micloșoara. Viscri became better known after Prince Charles bought a house there in 1996, and its fortified church was subsequently awarded UNESCO status as a World Heritage site. 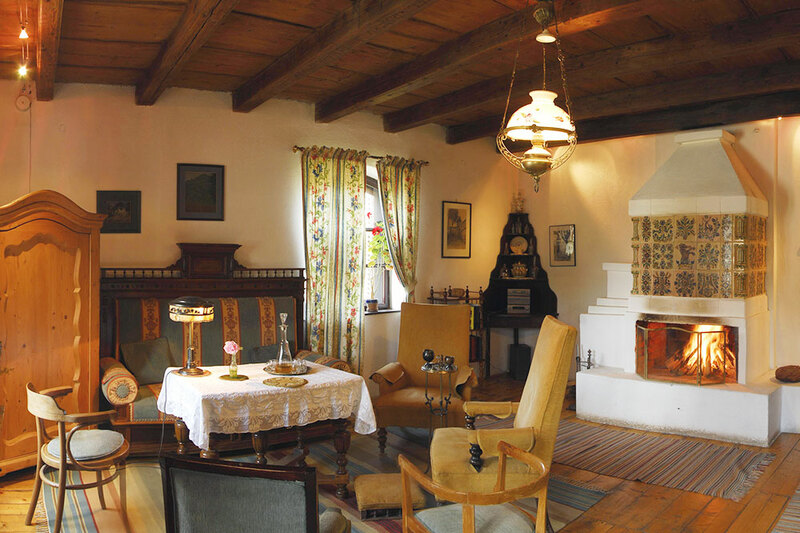 A pretty hamlet of pastel-painted houses with fish-scale terra-cotta tile roofs, Viscri was originally inhabited by Saxons, but most of them chose to move back to Germany in 1990, having been offered citizenship by the country’s then foreign minister, Hans-Dietrich Genscher. Many of the properties they left behind were occupied by Roma people or fell into ruin. Today more than 180 have been restored by the nonprofit Mihai Eminescu Trust using traditional brick, tile, lumber and ironwork. In addition, the village’s fortified 12th-century church is now open to the public and affords wonderful views over the village and surrounding countryside from its tower. A unique feature of the church is the Lard Tower, where every village family once stored a side of bacon branded with its house number in preparation for a siege. There’s also a small but fascinating museum of Saxon life, which displays farm implements, clothing and pottery. From Viscri, it’s another 45-minute drive to the delightful old town of Sighișoara, formerly known as Schässburg in German, and one of the Siebenbürgen, or seven fortified towns founded by the Saxons. Built on a hilltop, this is one of the best-preserved medieval towns in Europe. 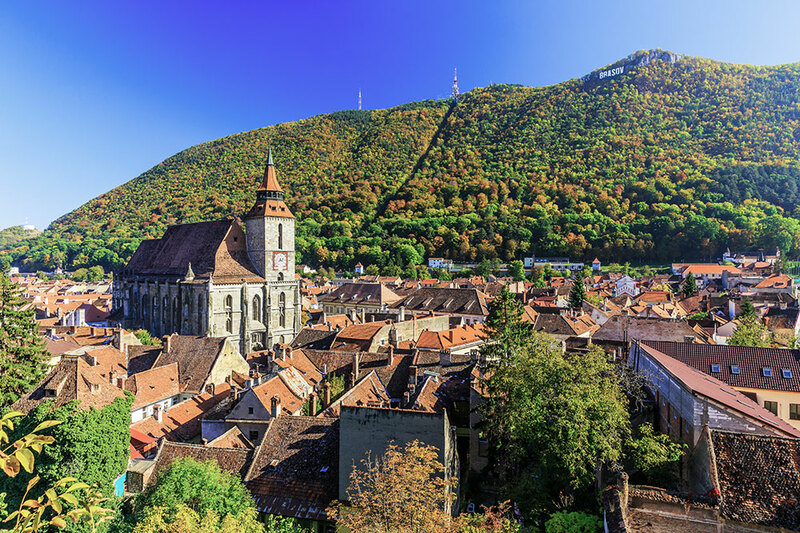 Recently, it has become one of the most popular tourist destinations in Transylvania, so the ideal time to arrive is late afternoon just as the crowds are leaving. The first time I stayed in Sighișoara, I enjoyed Casa Wagner, but the hotel has become overpriced and a bit worn, so on this occasion I spent a night at the nine-room Fronius Residence, a 17th-century house that is located in the old town at the foot of the Scholars’ Stairs, a covered 175-step stairway that leads up to the landmark Church on the Hill. 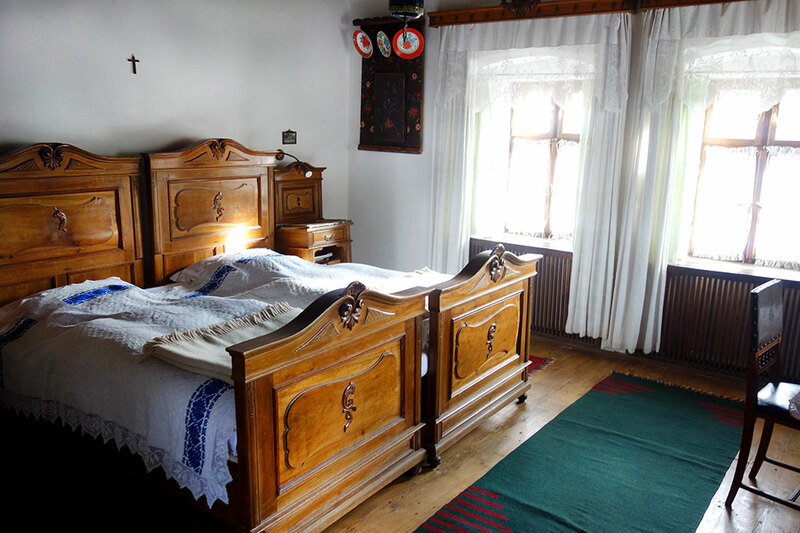 Every room at this well-run and very comfortable guesthouse is furnished differently, but the one I recommend is Antonia, which is bright, quiet and appointed with blond-wood antique furniture. Though the Fronius is not a conventional luxury hotel, it offers excellent-quality beds, room service, air-conditioning, cable TV and Wi-Fi. 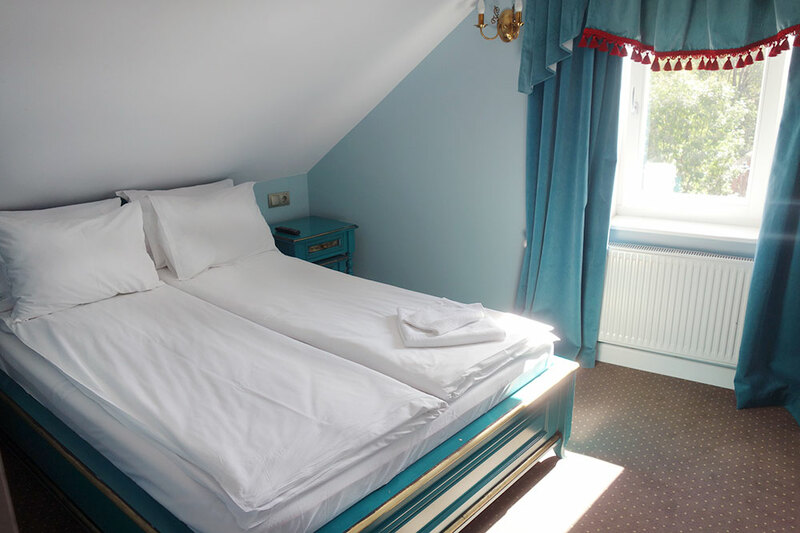 Charming and perfectly located, it’s a good choice for a night in Sighișoara. Immaculate and well-furnished rooms; the atmospheric bar. The lack of a restaurant. Contact the hotel in advance for instructions about accessing the property. The following day, I left the main road from Sighișoara to Mediaș to visit Mălâncrav, which has the largest remaining population of Saxons in Transylvania. Despite being isolated, this quiet and tidy commune of well-maintained pastel-painted houses has a prosperous air. This is mostly due to the restoration efforts of the Mihai Eminescu Trust, which has renovated many houses, replanted the local apple orchards and opened a fruit-processing plant, which produces high-quality organic apple juice. 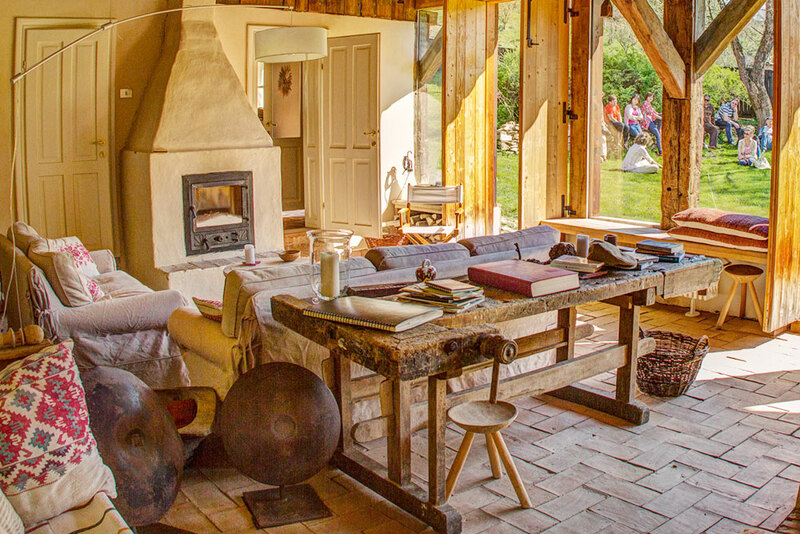 The trust has also renovated the handsome Apafi Manor above the village, which was once home to a family of Hungarian nobles of the same name from 1340 to the end of the 18th century. Of particular note in Mălâncrav are the 14th-century Gothic mural paintings in the church, which are considered the finest in Romania. 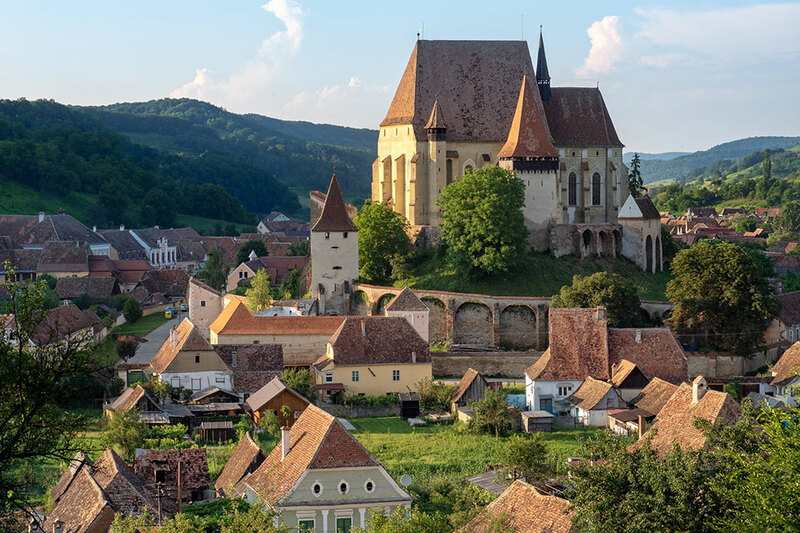 From Mălâncrav, it was a pleasant 35-minute drive along meandering backcountry roads to Biertan, which has become the most visited Saxon village after its 16th-century fortified church was enrolled as a UNESCO World Heritage site in 1993. The church is reached via a covered stairway, and its interior is notable for a magnificent folding altar with a carved crucifixion scene surrounded by painted panels. A winding lane leads from Biertan to the pretty village of Copșa Mare, a few miles to the southeast. 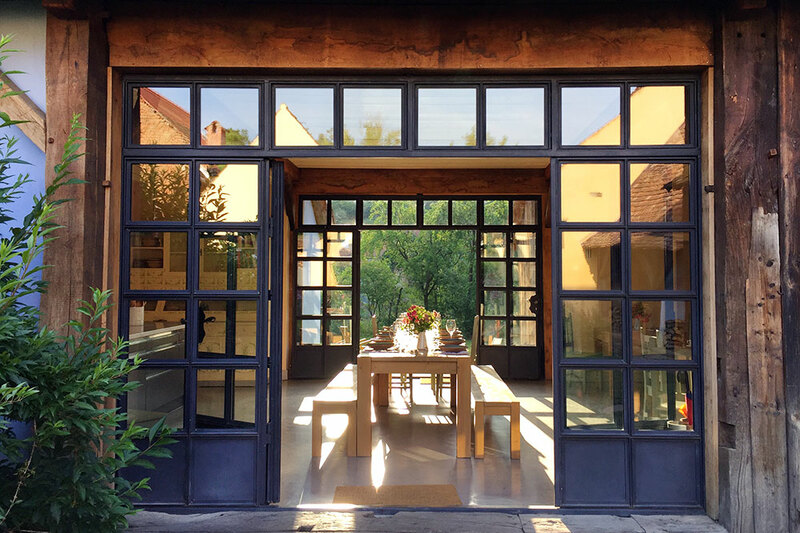 It was the charm of this hidden-away place that seduced Italians Paolo and Giovanna Bassetti when they visited from their home in Bucharest during a corporate posting there. Enchanted, they bought a house to restore as a vacation home, but then decided to convert it to an inn. Today the Copsamare Guesthouses has 10 rooms distributed among three houses, each within an easy walk of the main one, the Yellow House. On arrival, I was greeted by Simona, the friendly, English-speaking receptionist and cook, who offered tea with freshly baked cookies and then directed me to my room. 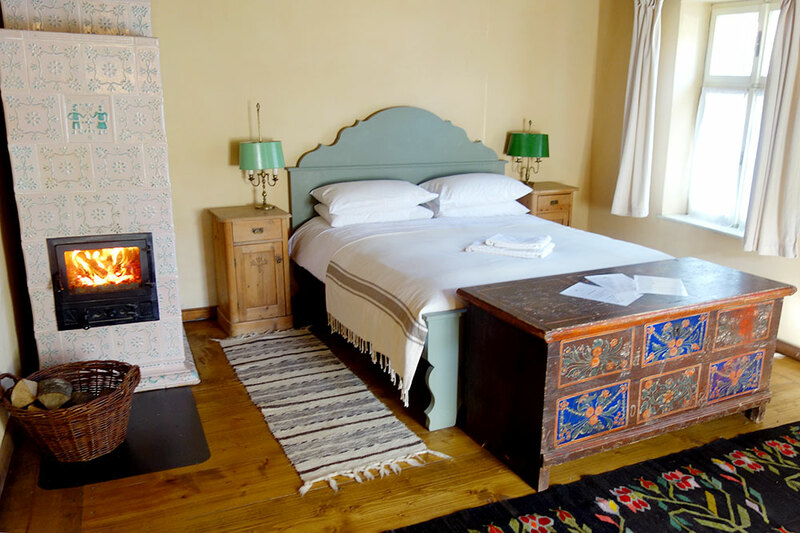 The Yellow Main Suite had a wood-framed sofa, armchairs and a tiled woodburning furnace, while the bedroom came with a second furnace, a locally made wood-framed double bed, a writing desk and colorful hand-loomed carpets on the oak floors. The bath was equipped with a stall shower and a single sink in a wooden counter. Here, too, there was no television or telephone, but the suite did have Wi-Fi. The next two days I spent hiking in the countryside and visiting nearby villages, returning each evening to enjoy more of Simona’s delicious cooking. Dinner always began with a soup, followed by dishes such as stuffed cabbage with mămăligă , the Romanian version of polenta, and hen braised in cabbage with roasted new potatoes. Tired after the day’s exercise, I found myself going to bed as early as the local farmers. Overall, Copsamare Guesthouses is a comfortable and attractive base from which to explore. The homey comfort of my suite; delicious home cooking. The lack of a tub in the bath. There is nowhere else to eat in the village, so evening meals should be booked when you make your reservation. 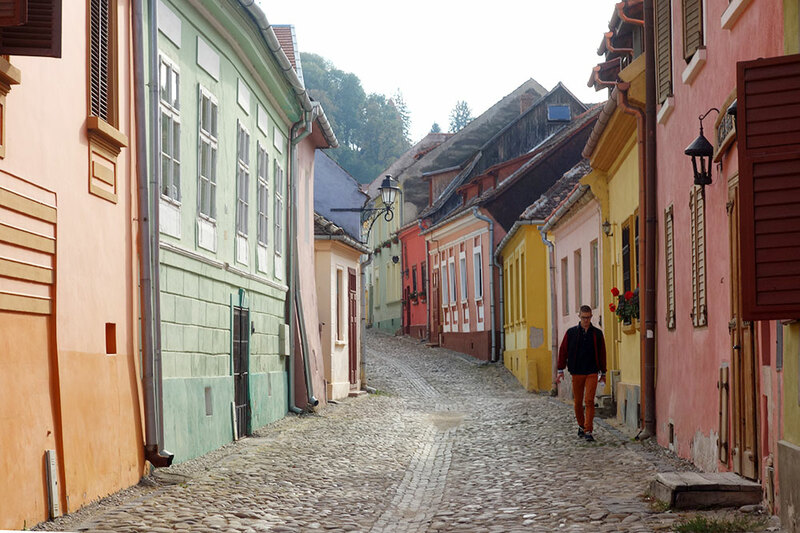 My last stop was Sibiu, 50 miles to the southwest, which was known as Hermannstadt when it was populated by Saxons. Most of them left long ago for Germany, Austria and the United States, but the Germanic imprint on this charming and well-groomed city is obvious. The profile of Sibiu was raised by the election of Klaus Iohannis, a man of Saxon descent and its former mayor, as president of Romania in 2014. Previously, Iohannis had been instrumental in making Sibiu a European Capital of Culture in 2007. It’s possible to visit Sibiu as a day trip from Copșa Mare, but since the city would be my last stop before a four-hour drive to Bucharest and my flight home, I decided to spend the night. As is true of many Transylvanian cities, the hotel options vary between modern properties catering to business travelers and small, often quirky boutique hotels in the historic center. 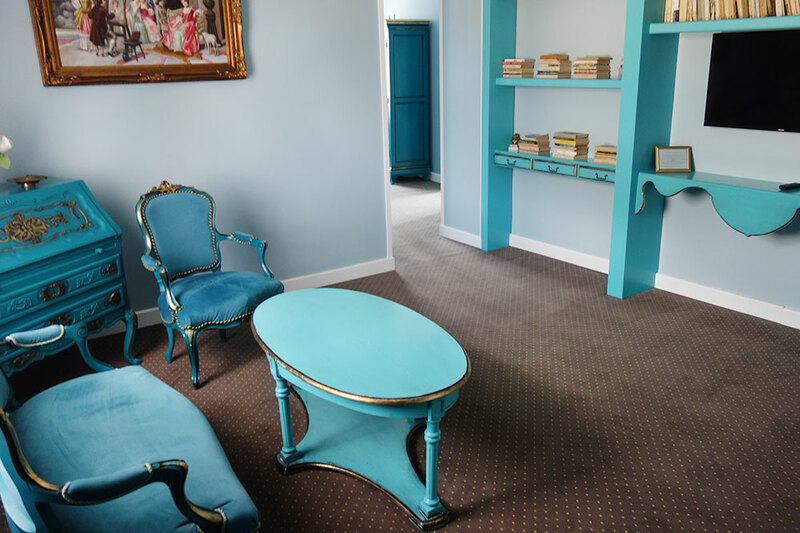 Taking a tip from friends in Bucharest, I booked at the eight-room Maison Elysée, which occupies a restored Belle Epoque mansion on the edge of the Upper Town within a five-minute walk of Sibiu’s Great Square. My suite on the second floor had a turquoise color scheme and a rather operatic décor, but it was spacious, quiet and comfortable, with a large sitting room appointed with a sofa, armchairs and a built-in wall unit filled with books, plus a large dressing room, a bedroom with a sloping ceiling and a well-lit bath with a shower and a single sink. The staff were charming, and the breakfast was excellent. For a single night, the property was entirely adequate. Sibiu does not warrant a two-night stay. Aside from its churches, squares and medieval half-timbered houses, the highlight of my visit was the Brukenthal National Museum, housed in the baroque palace of an aristocratic family. Baron Samuel von Brukenthal, the Habsburg governor of the Grand Principality of Transylvania between 1774 and 1787, acquired a small but remarkable art collection, which includes Jan van Eyck’s stunningly beautiful “Man in a Blue Turban.” In addition, the Emil Sigerus Museum of Ethnography and Saxon Folk Art offers some fascinating insights into Saxon culture, while a few miles outside Sibiu, the Astra Museum of Traditional Folk Civilization is also worthwhile. Culturally rich, peaceful and hospitable, Transylvania deserves to join the ranks of major European destinations. And for now, it is unspoiled, little known and, with its traditional character, blessedly intact. Solid comfort; convenient location; excellent breakfast. The hotel is located on a narrow street, so you will need to ask for directions to local parking garages from reception.